For those of you who have been following my adventures, you may think I should have called my blog, Yosemite (and sometimes the Bay Area) and Beyond. That's okay, I love Yosemite and can't get enough of that incredible place, even on one of the busiest weekends of the year - Memorial Day Weekend. My wife and daughter flew to Colorado to visit friends and I heard Yosemite calling. 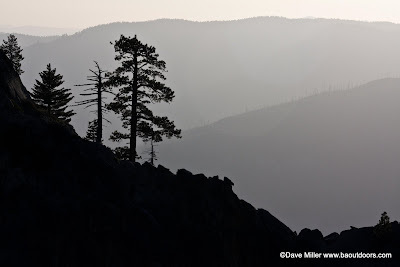 My original plan was to hike along the North Rim of the Valley from Porcupine Creek to North Dome, then to Yosemite Point and back to Porcupine Creek. 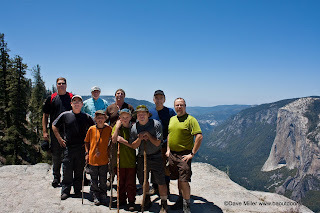 I talked so much about my Memorial Day trip to Yosemite, I was soon leading a group of nine! The Yosemite weather report and trail conditions were burned into my computer screen in the weeks before the trip and it wasn't looking promising. Although the North Rim of the valley around North Dome and Yosemite Falls was clear of snow, the trail from Porcupine Creek to North Dome was reported to have 75% to 100% snow coverage. Plus, Tioga Road had not opened yet. I made a number of backup plans, which is more challenging when you have a party of nine, especially for Memorial Day weekend in Yosemite! 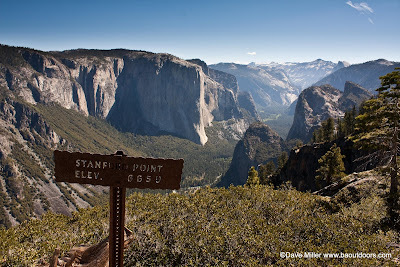 However, I was fortunate and able to switch my permit to Glacier Point and the Pohono Trail. It was actually my fourth choice, but it ended up being a great option. I had hiked part of this trail before with my son when mapping the Senitnel Dome Loop hike for BACKPACKER magazine. I knew the upper section of this trail had great views and destinations, but was not familiar with the rest. No matter, we had the permit! Early Saturday morning, the nine of us gathered at Glacier Point parking area, two rookies (Bert and Rafael), two energetic boys (Ron and Ray) and four seasoned veterans (Gary, Tim, Tony and myself) and one superstar (Bob, lots of stories about his exploits and climbing El Cap 25 years ago). The goal for the day was to get from Glacier Point to Bridalveil creek. The topo map showed it to be about 5.5 miles (really 6.4) and I figured it would take us about 5 hours. Not because the trail was too tough or my fellow hikers were slow, but because I knew about all the photographic opportunites along the way! Incredible views of Yosemite Falls (Upper, Middle Cascades and Lower), El Capitan, Three Brothers, Merced River and too many others caused us to frequently stop and take it all in. The views were captivating and breathtaking. Our first real break was at the Sentinel Creek crossing. 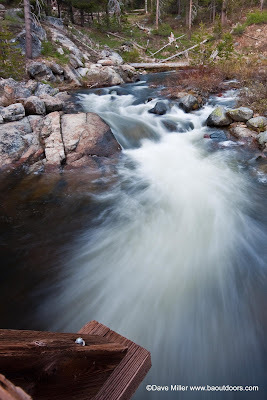 A spur trail follows the creek downstream towards the rim and up on a point (I call it Sentinel Point). This was the first of several vertigo inducing locations. 3500ft drops straight down to the valley floor. More stops along the way at Taft Point and Profile Cliff. The packs came off and the cameras came out. Some were more daring than others, but we all had our gut wrenching peeks over the edge. 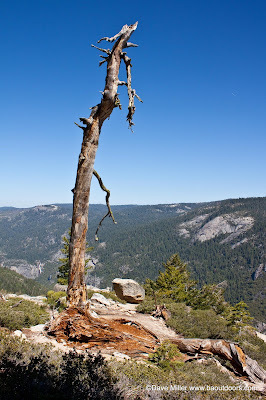 From Taft Point we headed inland to Bridalveil Creek, crossing a few ephemeral streams along the way. Although we left the rim and views of the valley, we still had the pleasant sights and sounds of the forest. Who needs an iPod when you have that! We finally arrived at the footbridge over Bridalveil creek. Bob beat us all there and had staked a claim to a great campsite. One that could handle our whole group. He even had firewood piled up next to the fire ring! We got the camp setup and Gary had a special surprise for dinner: Beef Fajitas! 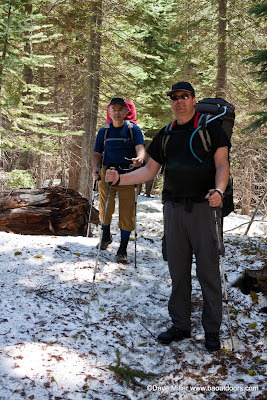 Not our normal backpacking fare, but he was training for the JMT and decided the extra weight was a good thing and the meal was a great thing! 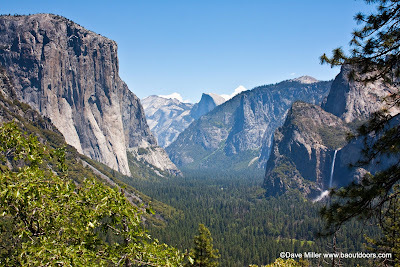 The original plan was to hike from Glacier Point to the Bridalveil Creek Area and base camp there two nights. The second day would be a day hike to the Dewey Point area and back to base. We would then return to Glacier Point on our last day (Monday). It's great to have a plan! There was some talk about doing the whole Pohono Trail to the Wawona Tunnel, but we did not leave a car there and would have to get a ride back to Glacier Point. What the heck, we figured it would all work out so the plans were changed. The next morning we had a great breakfast (using the left over fajitas with some freeze dried eggs) and broke camp. Our next destination was Dewey Point (2.5 miles) and possibly beyond. I was surprised by the amount of uphill we had to get from Bridalveil to Dewey, in fact, I had told the guys it was going to be mostly downhill. Oops, my mistake! I had been to Dewey Point before, but from Badger Pass by way of snowshoes. Winter or summer, this was still a spectacular location. There is no water at Dewey Point and we planned on going further to find a camp, but it was such a great place to be, we located a nice site near the point (not on the point) to setup camp. Rafael and the boys headed back to a creek to get water and we relaxed for the rest of the day, had dinner and then waited for the sunset. The snow capped hills to the east kept us captivated and I was really looking forward to being out in the open for the sunset and stargazing. It was just a day past the new moon and I expected great things. The sunset didn't dissapoint (although I didn't get much color on Half Dome) and the stars were quickly out. I knew there were some great possibilities later in the night, but was already beat and turned in after my son Ron and I took some photos and watched all the lights on the face of El Capitan from the headlamps of the climbers. I ended up waking up at 3:30 am and peeked out my tent door. WOW! What a site! I won't forget that anytime soon. I can only imagine what it must have been like 100 years ago before all the light pollution. Now we have to travel hours or days to see a night sky like the one I saw that night. The next day was a blur. Sunrise, breakfast, packup, hit the trail! Only 5.5 miles to go, but so many more photo ops. Crocker Point and Stanford Point kept our miles per hour way down and our happiness meters way up! Each point we visited brought us a differnent vision of the valley and a wonder at how, seeing the same thing over and over, can be so fresh. Once we were passed Stanford Point, the major descent was upon us. With a 3000ft drop in 3 miles, I expected some switchbacks, but the first two miles were pretty much straight down with a few level spots in between. The last mile brought the switchbacks I was expecting, but the trail also provided a myriad of wildflowers and classic views of Yosemite Valley. The valley views were similar to Tunnel View without the cars, buses and people. I really enjoyed that! We made it to the tunnel with smiles all around. A few of the guys decided to pass on Dewey and head back towards Glacier on Sunday. 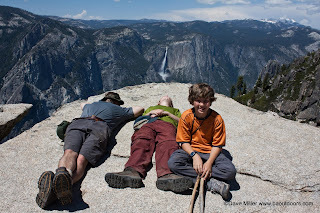 They camped out near Sentinel Dome and were waiting for us when we arrived at Tunnel View. One thing that really stuck out on this hike was how few people we encountered along the way. 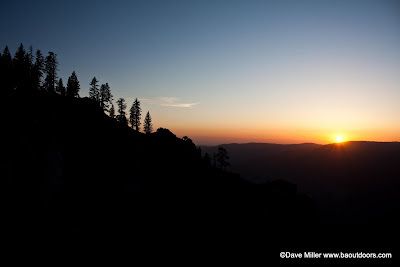 Of course, there were the day hikers going to Taft Point or Dewey Point. But, there really were not that many to feel like we were being over run or smothered. The fact was that the valley was packed (as witnessed by the slow moving stream of tail lights leaving the valley Sunday night). 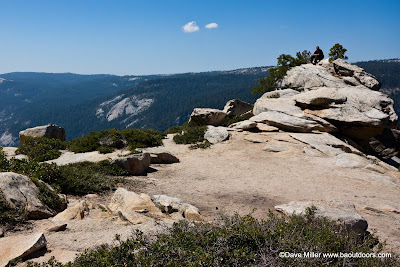 Not a lot of people make it up to Glacier Point and even less hike the whole Pohono Trail. We saw no one on the trail Monday until we got within a mile of the tunnel. The 13 mile Pohono Trail is a moderate hike that can be done in one, two or three days (stretching it, but worked well for us). The scenery from the trail and featured points is unmatched (execpt maybe from the North Rim, it might be a tie) and the relative solitude for being that close to the valley can't be discounted. Although this hike has not yet been published for BACKPACKER, you can view my rough draft map and report of this hike at TrimbleOutdoors. The link has many more specific details about the hike including waypoints and the ability to check it out on Google Earth( you may have to register for a free account to access parts of the report). You can view more photos (better quality and higher resolution) from this trip on my SmugMug site. I welcome your comments. Thanks for taking the time to check out this hike. Classic view of the valley, without the crowds or fumes. View from my tent. WOW! Nice trip, great photos. 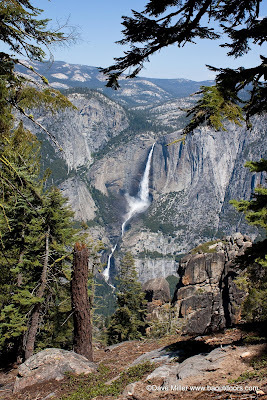 Yosemite is like a little slice of heaven in your backyard. The gang must have had a blast. They're appreciate the memories as they grow older. Your comments and pictures are eloquent and superlative (as usual) and make me almost feel like I was there. I really, really need to accompany you on one of your hikes. Scott, It was a blast! I can't wait to read about your trip. Mark, Thanks. Glad you liked it. I'd love to have you along on one of my trips. You are always invited. You need to post info on your excursion to Sierra Point. I want to know more about it! Ok, just put up my info on Sierra Point. Beautiful job as always, Dave. I just told my readers to come check it out. Thanks. I appreciate the encouragement. I'm hoping to get up your way some day and do some exploring there. You certainly have provided a lot of good trip options. really amazing photography. i was at yosemite (half dome) just last night. i wish i could have captured it on film half as well as you did. any killer tricks for great photos like that? Hey Ben, Thanks for the comments. My sunset shots were handheld and it was just a matter of being in the right place at the right time for part of it. Try to make sure to have some sort of feature subject that draws the eye. 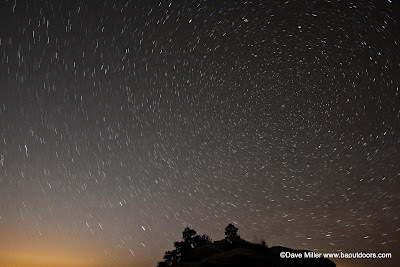 For star photos, you need a tripod and the ability for long exposures. The one shot at Dewey Point with the star trails was a 5 minute and 20 second exposure at f4.5 1600 ISO. 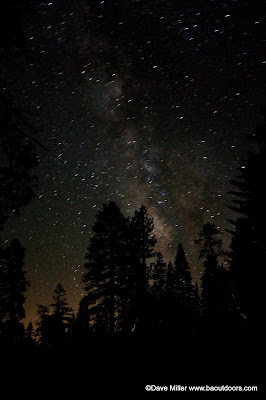 The photo of the Milky Way was done outside my tent with the camera sitting in my camera bag, angled towards the sky. It was shot using f4.5 ISO 1600 with a 72 second exposure. It helps to have a remote shutter and the ability to change your ISO settings. I'm still playing with it and trying to find a way to better focus. I sure enjoy it though! I hope I helped. Feel free to ask more questions. Ben, one more thing. I'd love to be on Half Dome at the Sunset. It must have been quite an experience. I was there last year at this time and made it to the top at about 9:00am. It certainly is a very special place! Looks like a fantastic trip Dave. Your photos are really nice. I've hiked the Pohono many times and never get tired of doing it. 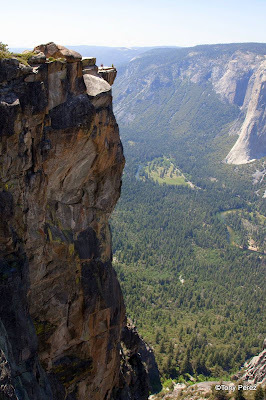 Yosemite is like that. It gets into your blood. My wife and I just got back from a Yosemite camping trip a few weeks ago. I did some write up on my blog. It was a great trip. I can't wait for my next one. I followed your exploits in Yosemite and was jealous. Looks like you really covered some territory. We'll have to meet up some time and hit the trail! So the Pohono trail isn't buried in snow still? We tried it a few weeks ago and had to give up due to really deep snow. We've been looking for it to clear out so we can retry it. Great description! You should have no problem whatsoever. There were a couple of sections with snow while I was there but nothing more than a couple inches deep. 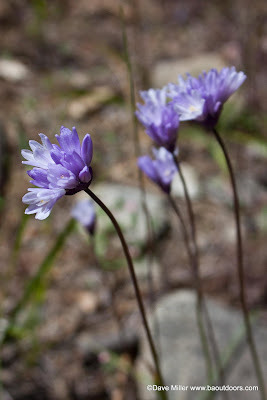 I just found this article while reseaaching about the Pohono trail. I am thinking of doing it during the July 4th weekend. I wanted to ask if there's a permit required to camp in Yosemite? I know there are campgrounds but they are all reserved and I don't know if Ill be able to get one at the first come, first serve ones. Hence, the question. 40% of the permit quota is held in reserve for walkups. Those are released the day before. So, if you wanted to start your hike on Friday, you would need to obtain your permit the previous day (Thursday). Permit holders are allowed to stay in the Backpacker's campground that night.